What a treasure we have in Taylor Jenkins Reid. Her novels are so compelling and readable, and although they may seem fluffy, they have always made me think. She creates vivid characters and places them into such thought provoking situations. Maybe in Another Life had me thinking: if I could do my life over again, would I make different choices? One True Loves certainly makes you think about just that: is there only one true love for each of us? They are really great conversation starting novels, putting yourself in the character's shoes. Her latest is somewhat of a departure from her previous contemporary women's fiction, with a throwback, old Hollywood narrative. But the thought provoking themes are still present. What stayed with me from this novel was the struggle of the LGBTQ community, female empowerment, women's roles and how those roles have changed over time. Evelyn Hugo and her journey of empowerment is absolutely captivating. I felt as if she were a real celebrity and I was indeed reading a memoir. Although I couldn't imagine a more riveting tell-all, which means there's got to be one out there, as the truth is usually stranger than fiction. Until then, this exquisitely complex character can fill that void. Reid peppers Hugo's dialogue with some stellar witticisms and keen observations. It grabbed me right from the beginning. The mystery of why Evelyn chooses inexperienced Monique as her biographer is the immediate mystery. Then, as she tells the 'pulling up her bootstraps' beginning of her Hollywood story it feels so real, I was absorbed immediately and had to learn more. Reid recently shared her favorite Hollywood memoirs and I would be surprised if many of those early Hollywood stars didn't face similar struggles. There are short flashes back to present day Monique dealing with the separation from her husband, while she interviews Evelyn and struggles with how this 'big break' will affect her current job and career. But the bulk of the story is Evelyn reminiscing as she weaves her way through Hollywood, and her many husbands. I think that there might have been one too many husbands, making things slightly more complicated than necessary. Yet they each played a role and none of them in the way it would seem on the surface. Yes, there is a grand love story. In fact, I would argue there are at least three, and not in the way one would assume from the title. 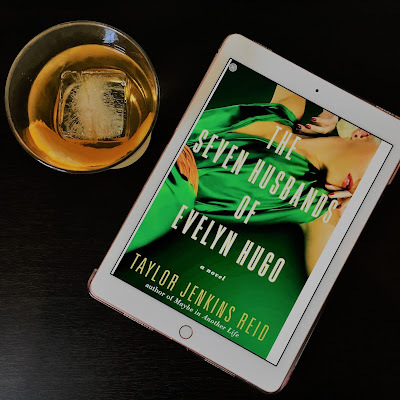 Reid portrays such genuine relationships in her writing, illustrating perfectly that the love of your life can come in many different forms: romantic, or otherwise. The last section, including the reveal of Monique and Evelyn's connection, was packed full of surprising wallops to my heart: terrible and wonderful all at the same time. It is reminiscent of some of my all time favorites like Beaches and Beautiful Ruins , one of very few books where I had misty eyes and a huge grin on my face as I read the last sentence. It would make for an excellent and absorbing beach read. However, in true Taylor Jenkins Reid fashion, it's just as suited to the gravitas of a whiskey drink and a good cry. Many, many thanks to Atria books for the opportunity to read an advance copy for my review! Yours is the second great review of this book I've read today. I guess it might be time for me to take another look at Taylor Jenkins Reid! This sounds like a perfect vacation read. I (excitedly) have this on hold at the library! One True Loves was one of my favorite reads last year! I'm considering this one for when I'm next craving a light read!